I suppose I can’t put it off any longer. I really don’t feel like getting my mind dirty, but it must be done. So. Big decisions to be made on Wednesday, yes? Do we lie on the beach, go shoplifting at the mall or stay in bed with a bottle of gin and the curtains drawn? Hard times call for hard choices. I suppose some of you may want to vote. Suit yourself. Just don’t come crying to me afterwards. I haven’t received a single pre-recorded phone call or sms from a political party. It’s almost as if they don’t want my vote. Good. Because they’re not getting it. 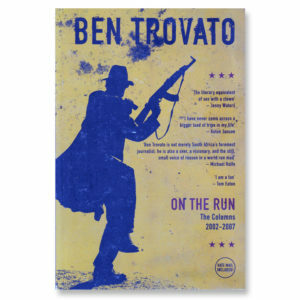 Elsewhere in Africa at election time the complaint is, “They tore my leg off.” Get a grip. Don’t go whining to the IEC unless your polling station gets blown up and you’re carrying your kidneys in a bucket. 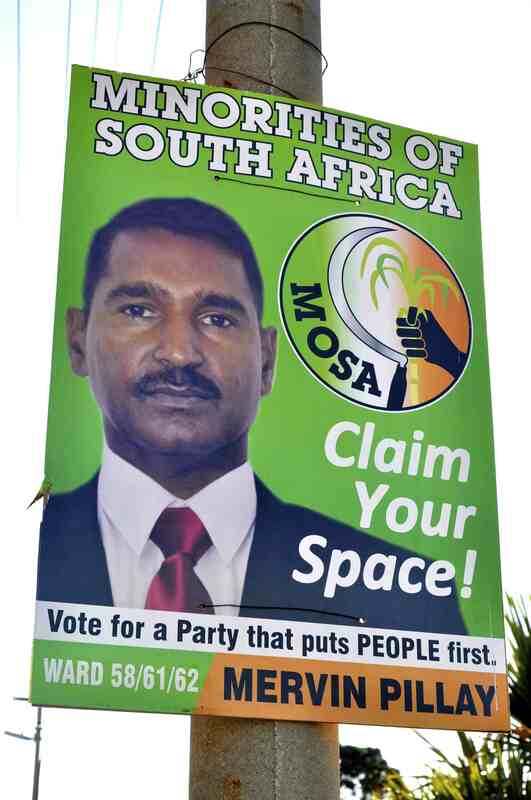 I felt a brief surge of hope when I saw the poster, “Chainsaw attack on DA man”, but it turned out that the merry prankster had merely sliced off the side mirror on Pietermaritzburg mayoral candidate Mergan Chetty’s car. The politician was part of a 75-car motorcade. I don’t even know 75 people with cars. Chetty said he shouted at the man, asking him what’s wrong. This is an indication of Chetty’s commitment to politics at the local level. Even as the Imbali township version of Leatherface launches his one-man chop shop, he wants to know more about the man’s problems. There are 206 parties contesting Wednesday’s elections. I imagine that most of these people filled in their applications to register as candidates for the same reason they fill in their Lotto cards every week. Tata ma chance. Councillors earn between R40 000 and R80 000 a month depending on the municipality. Nice work if you can get it. I use the word ‘work’ loosely. Last year, only 40 of the 278 councils in South Africa received clean audits. Ten had sold the office stationery for zamaleks and were unable to to submit their financial statements on time. Warthogs wallowing in bottomless pools of money. If you’re not sure which party to vote for, here’s some information that might help you make up your mind who not to vote for. The governor of the Reserve Bank has forecast 0% growth for 2016. If, like me, you have trouble understanding numbers, let me break it down for you in words. Zero. Percent. Growth. The good news is that we all get to star in the movie, Honey, I Shrunk The Economy, produced by the ANC and directed by Jacob Zuma. Before you vote, think about what kind of South Africa you want to live in. I already know the answer and I’m not even voting. I want to live in a South Africa where colour doesn’t matter. A South Africa with no white people. No black people. No people at all. Just a country full of animals. That, however, might take a while. Ask yourself, then, what kind of South Africa do you want to leave for your children? If you don’t have children, or have children but don’t particularly like them, you may skip this section. Actually, don’t ask yourself anything. Ask your children. I expect the answers will include an end to compulsory education, free money and cheaper, better weed. If these are, in fact, the policies of any party out there, please let me know before Wednesday. Speaking of delusions, we are lucky to have such an awesome president. 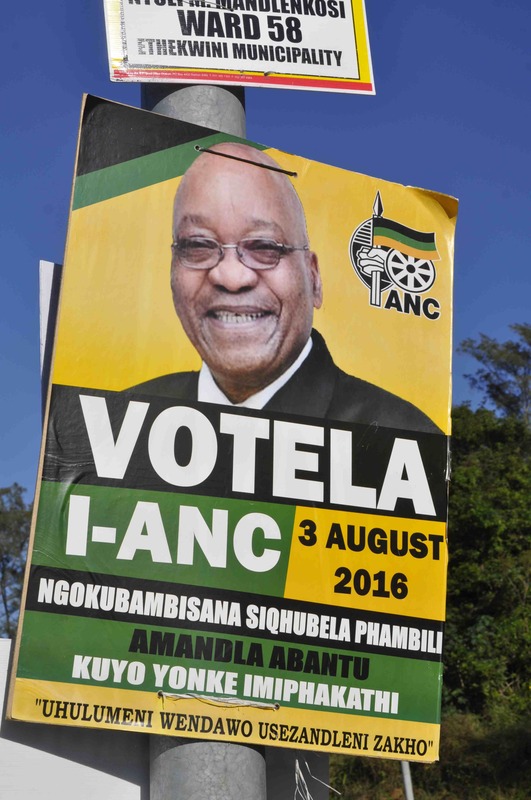 Speaking to ANC supporters in Inchanga a few days ago, Zuma slammed independent candidates for dividing the ANC vote. He described them as “witches” who would’ve been “impaled back in the day”. It’s common knowledge that anyone who isn’t a rabid fan of the ruling party must be a witch, warlock or goblin. Impaling is too good for them, I say. Burning at the stake. Now there’s a fitting punishment for the 21st century. But then Zuma said they couldn’t be killed because “we are now living in a democratic system”. This must have come as a huge disappointment to everyone who had already begun sharpening their impalers. There’s not much use for a sharpened stick without having a witch to stick on the end of it. I suppose you could buy a pig and have a spit braai, but it’s just not the same. Even though I’m not voting, I thought I should at least make the effort to find out who is standing in my area. When I say ‘effort’, I mean I walked down to the main road. I don’t know what ward I’m in. Most of the time it feels like the psych ward. 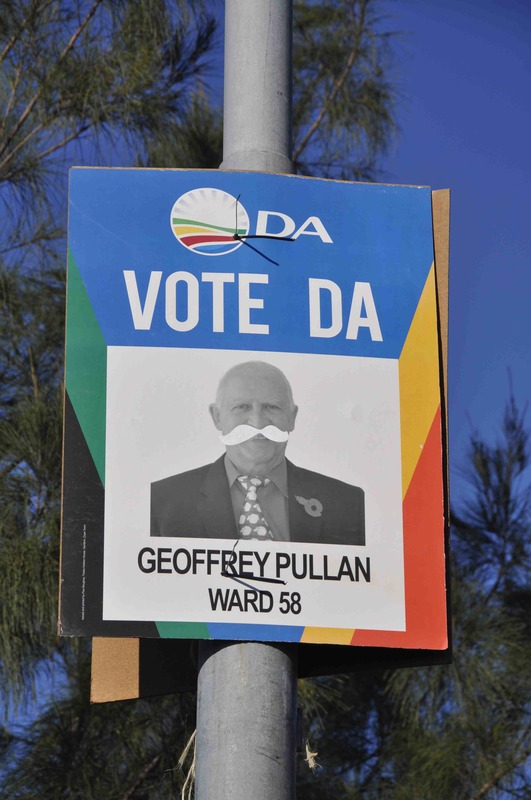 The DA says we should vote for someone called Geoffrey Pullen. It doesn’t say why. He looks like a Spitfire pilot cryogenically frozen in October 1940 after the Battle of Britain and has now been unfrozen to fight a far more cunning enemy than the Hun. Good luck, ace. Hold your fire until you see the yellows of their eyes. Then there’s Mervin Pillay from something called Minorities of South Africa. The slogan on the poster says, “Claim your space.” I don’t know what that means. Or even if I’m entitled to claim it. I expect so, though. In these parts, if you’re not a Zulu you’re a minority. This country is awash in minorities. If we all began claiming our space, there’d be nothing left for the majority. That’s how civil wars get started. 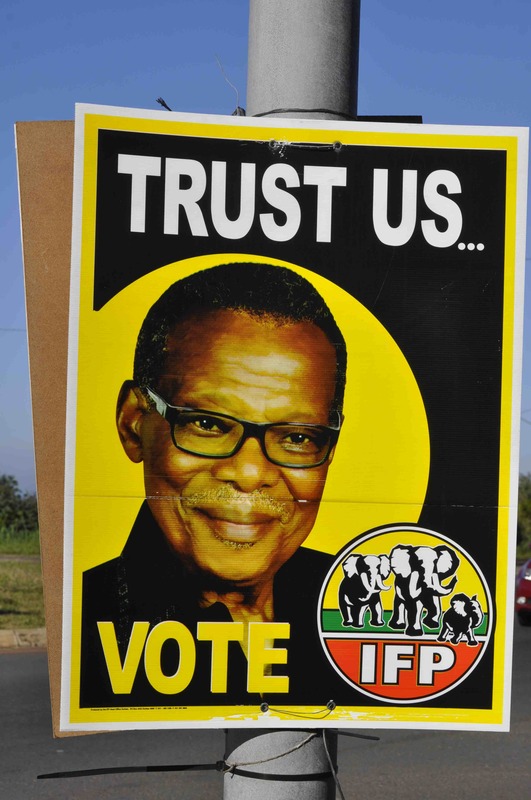 The IFP has a photo of that old warhorse Gatsha Buthelezi, who looks remarkably well for a 107-year-old man. The message is, “Trust us…” I think the ellipsis might have been a mistake because the temptation is to finish the sentence and it might not always count in their favour. The EFF’s man is Khuzwayo Mandla. His picture is in black and white, which is not in the least ironic unless you think about it, and makes him look like he’s wanted in three provinces. He’s not smiling because smiling is counter-revolutionary. If they win this ward, everyone will get a free farm, factory and two cows. There are no farms, factories or cows in my area. 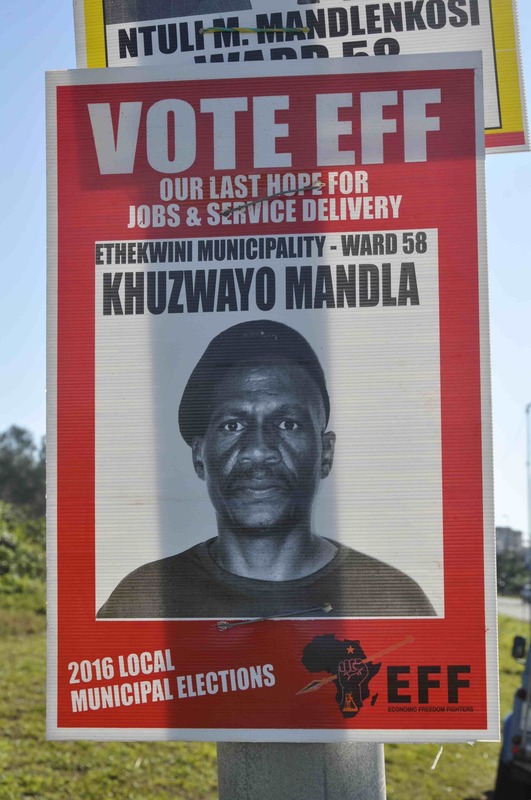 The party’s election manifesto does, at least, stipulate that, “A revolutionary councillor does not dwell in the conspicuous consumerist practices that seek to blindly show off privilege.” In other words, he will sleep under a bridge and catch a horse to work. And, of course, Jacob Zuma’s giant grinning head on a pole at the traffic circle. Not literally, unfortunately. On a poster. Elections provide the opportunity for change. I’m a big fan of change. I never stay married for more than ten years and I leave a job after five. Not always by choice, it must be said. Julius Malema has asked voters to give the EFF a municipality so they can prove themselves. Hell, why not? Okay, maybe not eThekwini, but surely there’s no harm in giving them something like Kai !Garib in the Northern Cape? So this is us – we, the people – sloshing about in gutters running thick with scurrilous calumny, militant hyperbole and enough hogwash to leave a million pot-bellied pigs clean and sweet-smelling while the supreme weasels wheedle and cajole, coax, fawn and pander, quibble, fence and lie – then cross their fingers and hope to die. Lastly, in case you still give a damn, here’s a convenient glossary of election terms. 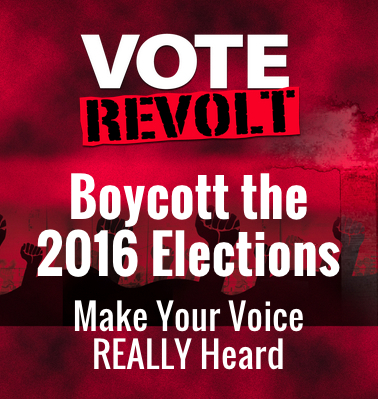 Democracy – A political system that punishes minorities for not breeding fast enough. From the Greek word ‘demo’ meaning ‘tyranny’ and ‘cracy’ meaning ‘of the majority’. Party – A political home for like-minded people. Something of a misnomer since nobody ever gets laid and drinks are in the House every five years. Manifesto – A document outlining a party’s policies. From the Greek word ‘mani’ meaning ‘barefaced’ and ‘festo’ meaning ‘lies’. Coalition – An alliance of parties more interested in power than principles. Proportional representation – An electoral formula guaranteeing members of parliament that they will never be confronted by an angry constituent. Polling booth – A secure environment in which control over one’s life is delegated, in writing, to perfect strangers. Door-to-door campaigning – An opportunity for poor people to get lied to directly to their faces. Poverty – A recurring condition that distresses politicians for a few weeks every five years. 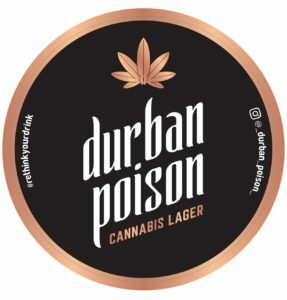 This entry was posted in Durban Poison and tagged 2016 local elections, ANC, Ben Trovato, Democratic Alliance, Economic Freedom Fighters, IEC, IFP, jacob zuma, South Africa, voting. Bookmark the permalink. 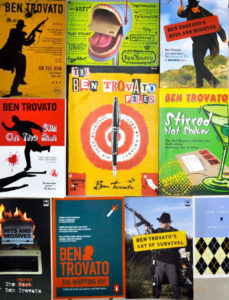 Where have you been Ben? 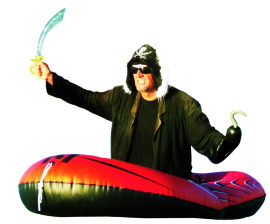 Probably deployed by the IEC to ensure free and fair riots on Aug 3rd……never a dull moment in this neck of the woods. The only coalition I like is that of cheetahs – not Cheeters.